At some point your facility may need chiller repair. Chillers are economical machines that delivers cooling processes for a number of applications in both commercial and industrial settings. In some cases, repair may be needed in an emergency situation. Alpha Energy Solutions can help. We are available 24-7 to handle service calls. While you cannot always anticipate a chiller repair, you can expect some possible wear with frequent use. Considering your current budget, profitability and use of energy, getting your chiller back online as quickly as possible is necessary. If you think that your chiller is in need of repair, contact a technician at Alpha Energy Solutions. A chiller provides cooling by transferring water which is used in air conditioning. Refrigerant carries heat to a condenser which is known as heat transfer. Heat is then removed from the water to process cooling. Heat that is already from multiple sources in a building is incorporated into the cooling process that takes place within a chiller. The size of a building largely determines how many chillers must be deployed to provide adequate cooling. Chiller malfunctions will become obvious because the unit will not perform well. Energy may be wasted, the machine may make more noise than usual. Most importantly, the chiller will not do its primary job which is to provide cooling. Certain issues with your chiller may be less noticeable which is why scheduling seasonal service is recommended. Chillers vary by design and there are many different models that are available through industry brands. Regardless of brand, chillers consist of several critical components which contribute to their performance. 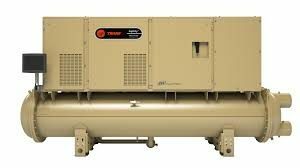 Below is a list of some components that may require chiller repair at one time or another. Among the selection of chillers on the market, you will find both air-cooled chillers and water-cooled chillers. The difference between the two types of chillers is how energy is transferred to create the cooling processes needed for your facility or project. Regardless of the application, chillers should still make the best use of energy and conserve water. Wasted energy and excessive use of water will impact your profitability. Contact Alpha Energy Solutions when your chiller needs repair. We have over 2000 years of field experienced combined. We handle jobs of all sizes and have access to all of the well-known brands for parts.